Despite many suggestions to reduce our dependence on cars during the past few decades, automobiles remain our transportation mode of choice and determine, to a large extent, the social and cultural dynamics of urban societies worldwide. Safety is always a convert. 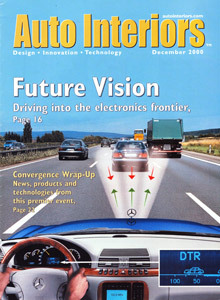 “Intelligent” systems that will provide “real-time” information on road conditions and traffic congestion will be supplemented by vision enhancement, navigation, and “driver impairment” recognition. Guidance systems will enable vehicles to communicate with the road and each other to constantly monitor the situation, issue warnings and override human commands that could be potentially hazardous. Existing navigational systems will be upgraded to include comprehensive intelligent highways systems such as ATIS — Automated Traveler Information Systems. Automobile engines will continue to evolve, improving efficiency and reducing exhaust emissions. Dependence on fossil fuels will gradually give way to “hybrid” engines and “fuel cells.” Future vehicles might even use induction motors that collect power from the roadway. These technologies will have a major impact on vehicle interiors. Only essential information will be provided to drivers and be reinforced by audio-visual signals. Ergonomics will play a major role in providing comfortable interiors for people who spend significant time between destinations. Personal information devices with voice-activated systems will be commonplace, along with “touch plates” and advanced optical systems to monitor vehicle operations.